Photo courtesy of Joanna Penn/ The Creative Penn via Flickr/ Creative Commons Licence. Where Blackwell’s inspires, Waterstones in Oxford frustrates. Occupying a prime corner position between the Cornmarket and Broad Street, this slightly down at heels outlet – urgently in need of a refit – is often crowded, shabby and dispiriting. The visitor is surprised that in such a temple of learning as Oxford, there is not a more impressive branch of the chain. Flagship this certainly isn’t. Entering from the bustling street outside, the ground floor feels as busy as the Cornmarket itself; for some reason, which I have yet to fathom, this a popular place. Perhaps customers think that this being Oxford it ought to be half decent. Customers like me certainly feel no sense of being on hallowed ground – it’s brash and it’s loud. The first thing of note is the rather flash e-reader sales stands, currently trying to entice readers to use a Kindle. Quite whose idea this was baffles me. Turkeys voting for Christmas anyone? Trying to escape the ground floor, every floorboard in the place seems to creak. Everything feels like a bit of a trudge to get to; perhaps the contrast with the Blackwell’s up the road doesn’t help. And elsewhere the flooring looks tired and the shelving dated. Which is all quite a shame really – this could be a magnificent place. Even the coffee shop feels …well… boring. Perhaps inevitably, it’s a Costa. The same Costa available at just about every major railway station/ airport/ half the nation’s garages and on every high street. OK, the taste is usually passable, but really, some imagination and individuality would be nice. But most subjects are covered and the stock is huge – somewhere, there is the potential for this landmark building to be doing an awful lot better. The ground floor has the usual bestsellers, cards, the already roundly criticised ebooks and a range of fiction. Upstairs, on three further floors (the shop uses buildings once occupied by the department store Debenhams) most other subjects are covered, with a basement devoted to children’s books. 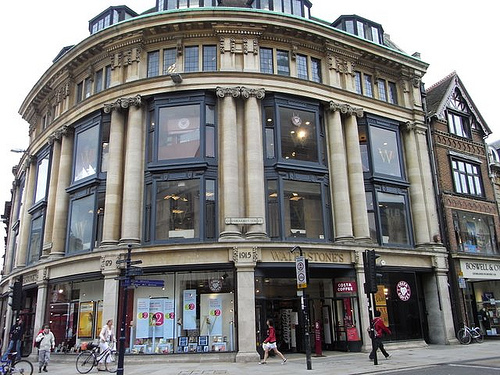 It’s interesting, however, to compare the stock with Blackwell’s: Waterstones in Oxford at least is definitely going for the more populist market. Poetry gets a look in, but nothing on the scale of Blackwell’s. Any plus sides? The shop hosts rather a lot of author visit type events. The Waterstone’s Card rewards customer loyalty and points can accrue very quickly. Staff are ok. And some of the books selected for promotion are worth it: I bought a brilliant parody of Star Wars written in Shakespearean English. The displays on the landings of the creaking stairs are well done, it’s open till 7.00pm most nights, and there’s a lift to avoid those creaking stairs! All in all, a frustrating experience. @andrewmillar72 thanks for review, actually we are having an extensive refit this Autumn, after which we’ll look all shiny and new! I can confirm that Waterstones in Oxford has not had a refit – at least not before Christmas.